The notice to explain negligence is a document which contains all the explanation and detail of negligence or misconduct. It is a scenario-based notice and varies from condition to condition. In professional life, the negligence cannot be taken for granted. These are taken into account and the culprit is informed about their negligence by using a notice. It states the further steps that the organizations could take if such negligence would be repeated. After explaining the negligence, the notice states serious actions or consequences such as termination from the job etc. The employee is asked to explain the reason for negligence or misconduct so that the company could accordingly make a wise decision about the employee. The format followed for the notice should be systematic. Every detail should be mentioned properly, clearly and in simple words. Avoid complexities are much as possible. Undoubtedly, negligence leaves a bad impact on the employee’s performance. Sometimes, negligence can even lead to drastic outcomes and the employee have to leave his job as a consequence of it. It is better to explain all the aspects of negligence. The jury or HR department is comprised of experienced persons who can comprehend the need of the hour. Carelessness or improper use of equipment, being absent from the office without informing, misbehaving with the other employees, breakage of expensive equipment, taking excess or less payment from the customer are some of the instances of negligence. Notice to explain negligence demands the proper detailing of the instance. The employee should excuse the negligence and must use a polite tone in order to retain his job. Harshness or dryness, after conducting a misconduct should be avoided. Organizations look for the employees who are honest, hardworking and work with entire responsibility. Notice to explain negligence warns the employee to refrain from such attitude and behavior in the future. I have been so absorbed with work lately that I had completely forgotten to consider my scheduled work. It’s just this time of the year that I get so much workload. I am writing this letter to apologize for my negligence and to explain any reasons. I still remember that I had to provide you with the month end reports. I am always very conscious of meeting any deadlines. 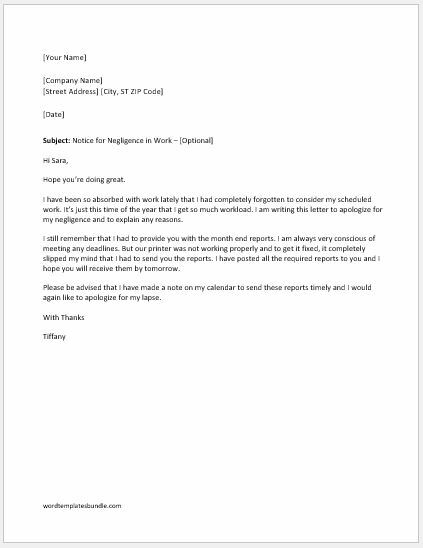 But our printer was not working properly and to get it fixed, it completely slipped my mind that I had to send you the reports. I have posted all the required reports to you and I hope you will receive them by tomorrow. Please be advised that I have made a note on my calendar to send these reports timely and I would again like to apologize for my lapse.